Quickly find the Best prices on Canon Image Stabilized Binoculars, with regular price checks on the latest Canon IS Binoculars offers. If you’re looking for the best image stabilized binoculars, Canon is a clear leader in the field with their range of image stabilized (IS) binoculars. There are currently six variations of Canon IS binoculars depending on your specific requirements. Choosing the best image stabilized binoculars for your needs will depend on the level of magnification, the field of view, the weight, portability, and of course the price tag. At the bottom of this post is a detailed comparison table to help you quickly understand the difference between each model of Canon IS Binoculars. How Canon IS binoculars work? ISB’s (Image-stabilized binoculars) work by pressing down a button to activate a combination of motion sensors, a microprocessor, and Canon’s unique variable angle prism technology. The VAP will instantly shift the optics to adjust the angle of incoming light to correct shaky hands, movement from breathing and even counteract the motion of a vehicle or boat. The lightest in the range and the least expensive set of Canon IS binoculars available. Powered by a single CR123A battery. With a relatively small field of view, limited battery life and not quite the same level of build quality as the other Canon image stabilized binoculars I’d recommend opting for the next model, if your budget can stretch a little further -more info. The 10×30 IS II Canon image stabilized binoculars are arguably the most versatile in the range due to their compact size and weight. With a much better build quality than the 8×25 Canon IS binoculars these are an excellent choice for those on a budget and certainly worth paying the extra for. -more info. The 12×36 IS III Canon image stabilized binoculars are at the top what is considered to be compact and lightweight. These IS binoculars are a great choice for those who find it difficult to comfortably handle the larger models in the range.-more info. The 10x42L Canon image stabilized binoculars are a serious step up in quality. With a much better field of view than it’s bigger brothers and also considerable lighter, these are considered by most as the ultimate set of binoculars for star gazing without a tripod. Also ideal for bird watchers thanks to it’s close-up focus of only 8 feet compared to 20 feet on the larger models. -more info. The 15×50 Canon image stabilized binoculars have fantastic magnification but this is at the cost of comfort. These Canon IS binoculars are physically large and not particular comfortable to hold, they are however considerable cheaper than the 10×42’s. -more info. The 18×50 Canon image stabilized binoculars are the most powerful in the range. 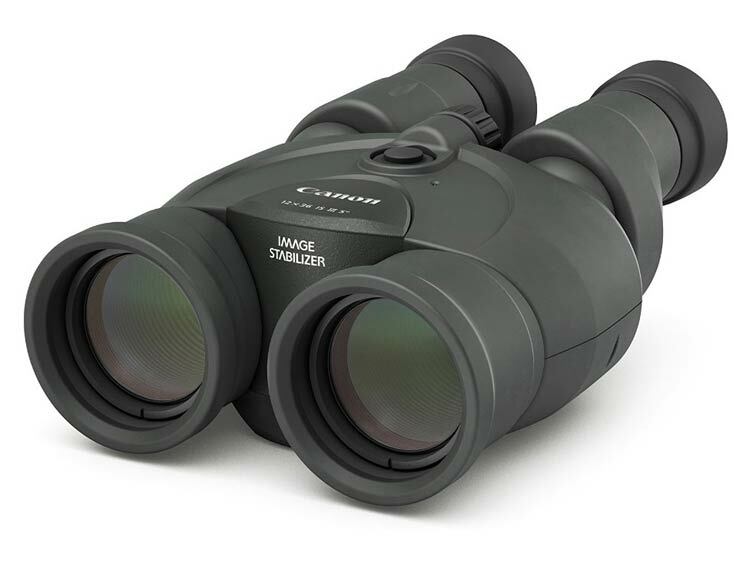 Very similar in size and weight to the 15X50’s, these Canon IS binoculars are all about maximising magnification and detail at the expense of comfort and field of view (only 3.7°) -more info. The above footage is a direct comparison between the Canon IS Binoculars with the Image stabilizing powered on and off. Here is a responsive table with the specifications of 6 variations of Canon Image Stabilizing Binoculars to help you easily compare the differences in features. If you are on a budget – The 10×30 Canon IS binoculars are significantly better than the 8×25’s and definitely worth paying a little extra for worth. If you want comfort and a good field of view – The 10×42’s are considered the best general purpose Canon IS binoculars. They offer the best field of view and are the most comfortable to use. If you want the best detail – The 18×50’s will give you by far the clearest view but at the cost of comfort and field of view. More suited to those who are able to take a seated position when viewing. If you found this post useful, please share it with the social buttons below or leave a comment – Thanks! Thanks for the Canon IS Binocular Comparison chart, made it a lot easier for me to decide which set of binoculars to buy, can’t wait for them to arrive! Hi Gretta, Sorry to hear that! Hopefully, he’ll get years of pleasure from them, There’s a saying “the price is forgotten well after the quality is remembered” or something like that. Amazon is typically a great place to buy Canon Image Stabilized Binoculars because, in order for the sellers to appear as the main one on the Amazon product page, they need to offer the lowest price. The competition often helps the price stay as low as possible. I’m a little concerned about the weight, I suffer from a muscle condition that makes it difficult to hold my arms up for long periods, so I need to switch hands. Any suggestions on a lightweight Image stabilized Monocular? Hi Jim, There is a Japanese company called Sunagor that make a fairly lightweight image stabilized monocular. It weighs 350 grams, (140 grams less than the lightest Canon IS binoculars) here’s a link to the product, hope that helps. I’ve been using Nikon Monarch 8×42 Binoculars for a few years now, they are crystal clear and I adore them. I do get frustrated however, with shaky hands when I’m without support. I’d love to get a set of 10×42 Canon Binoculars to replace them, my only fear is that at almost twice the weight, Instead of complaining about the shaky view, I’ll be moaning about my arms aching instead! The 12×36 IS III Canon image stabilized binoculars are not too heavy at around 660 grams, they are very good all-rounders and the same weight as the Nikon Monarch 8×42 binoculars. I’d love a set of Canon IS Binoculars but they are just way over my budget. For the last 15 years I’ve made do with binoculars I got from a charity shop. Now I’m retired I’d really like to focus more on my hobby. I’m wondering if I could buy a set of image stabilized binoculars second hand? If so, do you know of a reputable source? Thank You..
I’d try looking at the listings on Amazon, there are often both new and used Canon Is Binoculars on there. Otherwise, it might be worth going to some popular forums with large communities of bird watchers or star gazers. There is a Canon Image stabilized binoculars section on Birdforum.net – Hope that helps. I was about to splash out on a set of the 15×50 Canon IS binoculars from their official online shop…. SO glad I found this page, I had no idea Amazon had them listed for so cheap! I’m pleased you found it too, Don’t forget to share it socially, so others can find it easier. The prices for the Canon Image Stabilized Binoculars are constantly fluctuating on the Amazon listings. I do my best to keep them updated, and occasionally I see some big price drops on certain models. Those 15X50 IS binoculars were about $500 more the last time I checked. Really handy comparison info on the Canon image stabilised binoculars, thanks! Man i’d love to see these Canon IS Binoculars on offer next week during the Black Friday sale, what do you think the chances are? I didn’t see any deals on the Canon Image Stabilized binoculars on last year’s Black Friday, but I’ll be sure to keep my eye out, if they do drop the prices, I’ll be sure to add the info to this page. Simon, I am in a quandry. I think I am hooked on IS but which of the Canons to choose is becoming more and more difficult the more research I do. I am not a star-gazer but I would like to be able to view close birds, butterflies etc. Currently, I have 6×32 and 7×42 binos, which are fine but I want the extra magnification with a steady view. Please advise. It does depend on what your budget is, the 10×30 IS II would be the affordable option, with the 10X magnification offering a decent improvement over the X7 you currently have. If your budget can stretch further the 12×36 IS III’s are Canon’s best lightweight image stabilised binoculars, that model is fairly new, you might find an older 12×36 IS II if you look around. The only real difference is the energy efficiency (battery life). Beyond those two models, you’re looking at a fairly big step up in price and weight. The Canon 10X42L’s are expensive, but the build quality is vastly better than the 12×36 IS III binoculars and offer a better field of view. For bird watching assuming price wasn’t a factor, I’d choose the 10×42’s, otherwise, I’d opt for either the 10×30 or the 12×36 binoculars. If you’re not already a part of a bird watching forum, I’d highly recommend you check one out, there are loads of posts on the subject of Image Stabilized Binoculars. Here’s a link to the Canon section on Birdforum.net – Link Hope that helps, and good luck! this thread is great too. treated myself to the 12×36 IS III binoculars for my 40th birthday……..I used them for the first time this morning WOW! what a difference! I bought the Canon 10×30 is binoculars because I was a little hesitant about the weight of the larger models. I wish I had got the 12×36 IS III instead. A bird watching friend of mine just bought a pair and they are the best binoculars I’ve ever used. I might have to try and sell my 10×30’s on eBay and get an upgrade! Hi Claire, Thanks for leaving a comment. The good news is that Canon Binoculars tend to hold their value well (especially the image stabilised ones) if they are in good condition. Good luck selling them, I hope you get a good price. Nice to see the Canon 12 x 36 IS III binoculars coming down in price a little. Yes the Canon 12 x 36 IS III is a good price consider it’s a new model. It doesn’t perform quite as well as the larger IS binoculars, but at almost half the weight, it can be really handy for lightweight trips. The older I get the more I think I need image stabilizing binoculars. at 67 my hands are not as steady as they once were, tough when there isn’t anything to brace myself. Image stabilizing binoculars will definitely help with keeping the view steady, but they are likely to be heavier than regular binoculars. The 12×36 IS III Canon image stabilized binoculars are half the weight of the next size up, I’d give those a try. Hi Anna, thanks for your comment, I think the Canon 12 x 36 IS III binoculars are only available to pre-order right now for shipping at the end of next month. 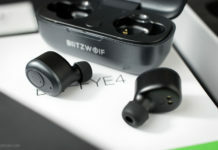 I will hopefully get a chance to test them in early August. It might also help bring the price of the 12 x 36 IS II model down a bit too, which will be nice. I’m also looking forward to the new canon 12 x 36 IS III image stabilising binoculars. They are definitely the best all round binoculars in their range. 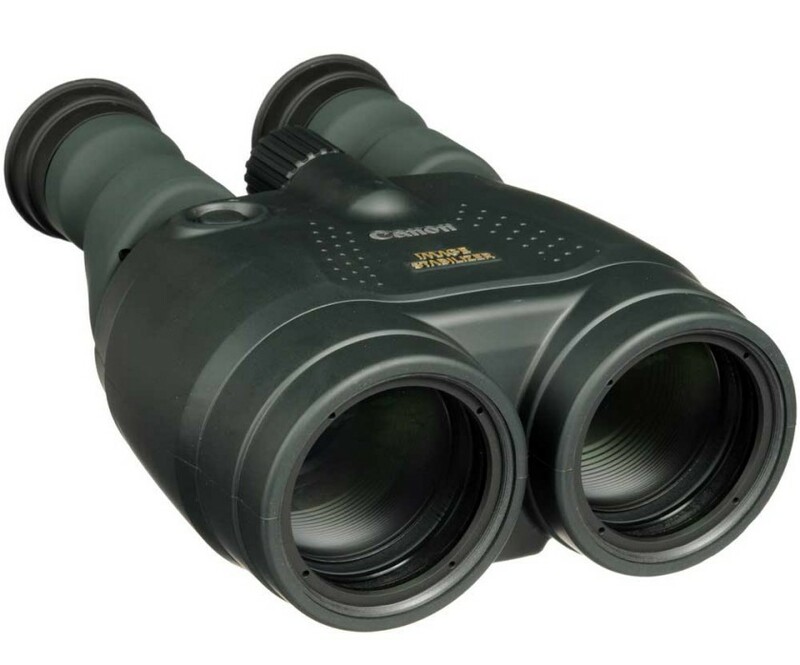 When are you reviewing the new Canon 12 x 36 IS III Binoculars? Thanks for the comment, the Canon 10×42’s are great all round binoculars, the 12×36’s are a lot cheaper, but it’s definitely worth saving the extra pennies and getting the 10×42’s if you can.